Addendum, June 1, 2010: There is now a VIDEO about the new Tulips buttonhole--click here! 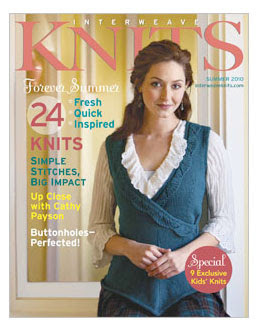 In the upcoming release of Interweave Knits, summer 2010, among the wonderful new designs and terrific articles, there is an article about buttonholes by TECHknitter (that's me!). Some older buttonholes will be reviewed and updated. Also, there will be some information about how to properly sew on a button and about buttonhole placement. But the most exciting thing (for me, anyway!) is that a new buttonhole technique will be revealed which I've been working on for years and years. Truthfully, after finally figuring out all the parts, it was not clear to me how it could be explained or illustrated, and I was ready to give up on ever bringing it to public attention. 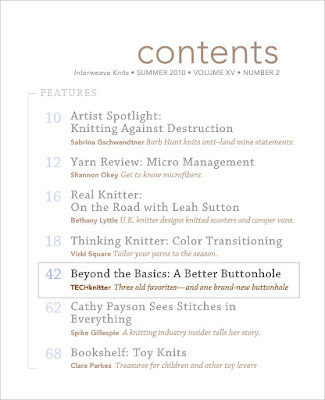 However, Eunny Jang, the editor of Interweave Knits, insisted on having a buttonhole article, and would not take "no" for an answer. Under her pressure, I kept plugging away at different methods of explaining it, and finally hit upon one. So, thanks to Eunny and her stubborn insistence, this new buttonhole is waiting to meet you all in the summer 2010 Interweave Knits. 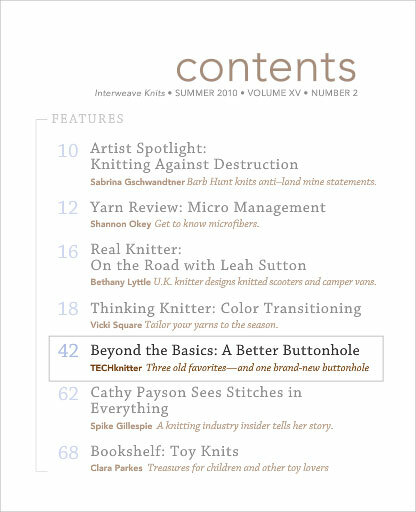 One year after this article comes out in Interweave Knits, the copyright reverts to TECHknitting blog, so watch this space in about a year for the complete illustrated details on-line. In the meanwhile, check out the print version, at your local bookstore or supermarket, or in your public library. I hope you will like this new article and will try the new buttonhole. PS: Don't forget, the Poll with a chance at a Prize is still running. Get your comments in by May 15 to qualify for a drawing of a prize--$20 gift certificate at the yarn shop of our choice.